NASCAR announced a series of rule changes on Tuesday that will go into effect beginning with the 2015 racing season. The rule changes apply to cars and engines and their aim, NASCAR officials said, is to improve competition, safety and the cost of doing business. They include reduction of spoiler heights on the rear deck lids of the cars and a major reduction in horsepower in the v-8 engines by using “tapered spacers” like those currently being used in the NASCAR Nationwide and Camping World Truck series. Gene Stefanyshyn, NASCAR senior vice president, innovation and racing development, said the horsepower reduction could offset an advantage gained by certain drivers through the decrease in spoiler height. “You’ve got to look at it holistically,” Stefanyshyn said. “On one hand, you could say that the downforce reduction may help the more talented drivers. The spoiler heights will be cut down from 8 inches to 6.0 inches. The spoiler modification is expected to reduce downforce and in doing so, increase the need for driver talent. The horsepower reduction – from about 900 to about 725 – will decrease acceleration on starts and restarts and, the hope is, lesson the advantage of “clean air” and facilitate passing. The lower horsepower also will help reduce the sport’s carbon footprint. NASCAR will provide and seal the tapered spacers, which will be used in Sprint Cup cars only at open-motor tracks. At the Daytona and Talladega superspeedways, restrictor plates will continue to be the means of reducing horsepower. Doug Yates, CEO of Roush-Yates Engines, was asked about the new engine specs. Car will also lose 50 pounds in 2015 – from 3,300 to 3,250. NASCAR has reduced the minimum weight requirement for the right side of the car from 1,620 to 1,595 pounds. NASCAR also announced a change to its team testing policy. All but banned will be independent, private tests. 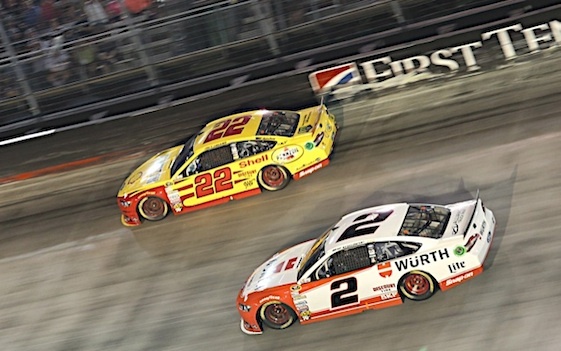 Teams be allowed to test independently at non-NASCAR venues such as Nashville, Rockingham, Colorado Springs or the Virginia International Raceway. Preseason Thunder testing at Daytona International Speedway in January has been canceled. Under new rules, I teams will be invited to participate in NASCAR-sponsored group tests or in Goodyear tire tests. The hope is the policy will reduce costs and also help shrink the performance gap between the have and have-less teams. “It’s a lot of cost we can take out of the system that is perhaps not of the highest value-added,” Stefanyshyn said, pointing out that testing on tracks NASCAR doesn’t race on with tires NASCAR doesn’t use may not be the most beneficial allocation of resources. Teams caught trying to work around the new policy will be slammed, NASCAR said. “The recommendation was to lay down a very severe penalty, and so it will be a P6 (the highest category of violation under NASCAR’s penalty system),” Stefanyshyn said. “A P6 penalty with a substantial financial hardship attached to it in the event somebody does decide to break the policy. Yates, asked about the testing rules, took a deep breath. “I’m not sure how I feel about not testing because we have an aerodynamic change and a power change,” he said. “The way that we achieve the RPM targets is through a gear ratio, so selecting that gear ratio is going to be a bit of a calculation going forward as we go to these race tracks as opposed to testing at the track and seeing exactly what you need. So I have some reservations about that, but we’ll just have to work together with NASCAR. NASCAR is also making plans to conduct races in wet weather. All cars will be fitted with windscreen wipers, defoggers and rear-flashing rain lights. Goodyear will supply rain tires for those venues, currently Sonoma Raceway and Watkins Glen International. Brian Vickers, driver of the No. 55 Michael Waltrip Racing Toyota, gave thumbs up to racing in the wet. • Lower rear differential gear ratios targeting 9,000 rpm. • Optional driver-adjustable track bar. • Roller valve lifters replacing flat valve lifters (a potential cost saving). • An optional electronic cluster (digital dashboard) in the cockpit of the race car, increasing the information available to the driver. NASCAR also will institute new officiating procedures for 2015, including a data log and capture system for pre-race inspections. The sanctioning body is automating its pit road officiating through the use of real-time video and is revising its process for inspecting tire inflation pressures. As cars progress through the inspection process, NASCAR officials will have access to an electronic “rap sheet” listing past violations from a particular team. “Our inspectors, currently when they inspect the cars, they have cards and pencils, and they write stuff down,” Stefanyshyn said. “At the end of the race, these cards get put in a box and they get stored somewhere. “What we’ve now done is we’ve equipped our inspectors with a surface tablet and a stylus. “As a car comes through, they pull up the car and they electronically log everything in there, so we’ll have it all in one place. So when he pulls up that car, he’ll have the history of where that car has had infractions in the last six months. Tuesday’s announcement means busy times ahead for Cup teams as they will have to adapt their equipment by the March race at Atlanta next years. And they will have to do it under the new testing guidelines. Yates was asked if five months was long enough to get all the work done.